Hotel One is a 3 star hotel in Sialkot it was previously known as RT Hotel built by Rauf Industries a prominent name in Sialkot. The Hotel One consists of very beautiful Restaurants including Cafe 24, a 24hrs restaurant, RT Hotel has most spacious rooms having all amenities of a 4-5 star hotel. The hotel is the best choice to stay at Sialkot. RT Hotel is an excellent vanue for conference meeting or any type of seminar in Sialkot. The hotel offer conference facilities from 50 - 500 people. Rates Include all government taxes daily breakfast and newspaper. Hotel One Sialkot in Sialkot, offers above rates only to Hunza tours. The online reservation payment must be made to Hunza tours not the hotel. Book your events, Meetings, Conferences Marriage parties at Hotel One Sialkot or any other hotel in Sialkot please feel free to email us we will offer you the best possible rates and perfect arrangements to suit your events. 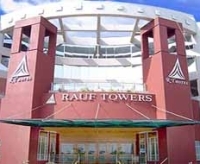 For room reservations at Rauf Tower Hotel Sialkot please contact usTravel & Culture Services are hotel reservation agents in Pakistan. We reserve hotels at special discounted rates for individuals and companies.